It's been four years since Apple last updated its Mac mini, but the company apparently heard calls to refresh the beloved headless Mac and on Tuesday delivered a machine worth waiting for. The 2018 Mac mini was introduced at Apple's Oct. 30 event. The mini was unveiled during Apple's recent media event on Oct. 30. In its marketing materials Apple seems to be positioning its diminutive Mac at professional users, showing off rendering farms with hundreds of Mac minis working together, touting its capabilities as a server and even illustrating how well the machine can handle live music gigs. But how will the new Mac mini benefit the average user? Simply put, it's the cheapest way to get a Mac outside of buying one used. Just bring a mouse, keyboard and display, and you've got a full-fledged Mac that packs some serious power. For 2018, Mac mini ditches the raw aluminum look for a Space Gray finish. On the back are a variety of ports, including HDMI 2.0, two USB 3 ports, four Thunderbolt 3 ports, a headphone jack and — for an extra $100 — a 10-gigabit ethernet port. 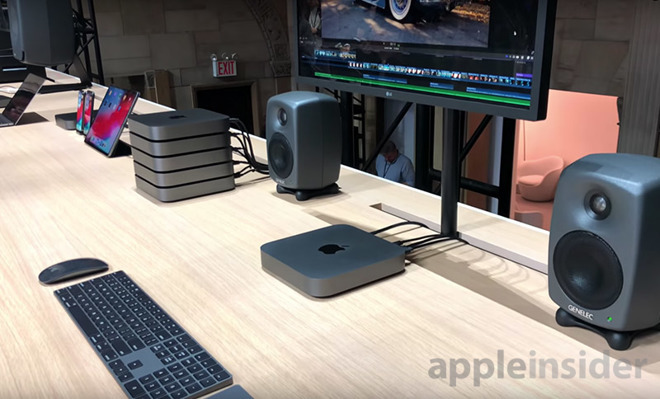 With the Thunderbolt 3 ports, users can transfer data at blazing fast speeds, connect an eGPU or even run up to two 4K displays. Mac mini sports a wide array of ports. Like the rest of Apple's recent Macs, the Mac mini comes with a T2 security chip, which handles different system functions including automatic storage encryption. The machine sports SSDs with up to 3.4GHz sequential read speeds, and users can configure their mini with up to 2TB of storage. This year's machine gets the same base 8GB of RAM that was offered with the 2014 model, except the memory is now much faster. The Intel processor powering the desktop can address up to 64GB of RAM, which users can configure at purchase or add on later. A new cooling system doubles the airflow, allowing the machine to run at a maximum sustained power that is 70 percent higher than before. The improved cooling system, and four years of advancements in the chipmaking industry, equate to massive performance gains. According to Geekbench 4 scores, the standard 4-core CPU nears the performance of the 2017 5K iMac's base processor. 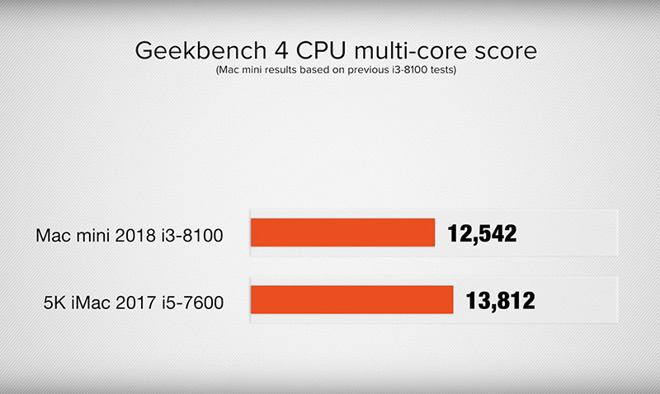 Mac mini benchmarks based on previous i3-8100 tests. 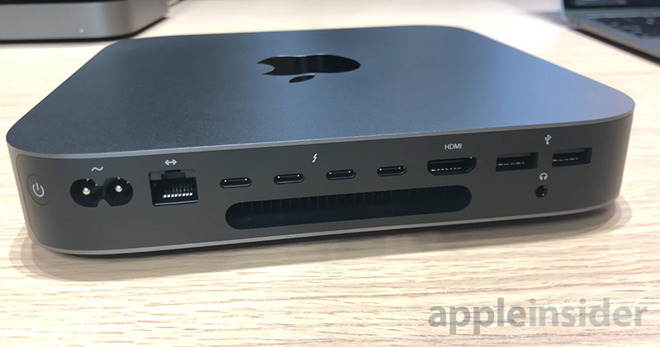 Compared to the previous Mac mini, Apple claims the 2018 model boasts 60 percent faster integrated graphics and a five fold boost to overall system performance. Those numbers are based on a Mac mini with a 3.2GHz 6-core 12-thread Core i7 processor that turbo-boosts up to 4.6GHz. The base $799 model gets buyers a 3.6Ghz quad-core Core i3, which interestingly lacks support for Turbo Boost and Hyperthreading. A 6-core processor with those options is available as a $300 upgrade. The entry level mini comes with 128GB of storage, with an options to upgrade to 256GB for $200. A step-up model includes a 6-core processor and 256GB of storage, but that chip also lacks Hyperthreading. Overall, the Mac mini is the cheapest way to get a Mac, and this year performance is up there with the rest of Apple's lineup. Apple's new 2018 Mac Mini is available to order now starting at $799.